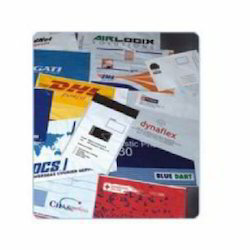 Manufacturer of a wide range of products which include courier flyers. Available with us is an attractively designed collection of Courier Flyers. These bags are crafted using high quality sixty micron polyethylene, which is a little thick and available in customized sizes. Our offered flyers are ideal for transportation of documents and parcels. Moreover, we offer these to customers in various specifications.